A former mayor will be remembered for her ‘legendary’ sense of humour. 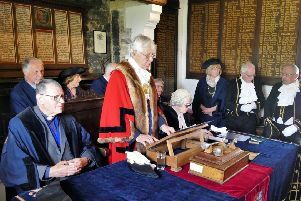 Frances Winterborn, who was mayor of Bexhill in 2013-14 and a Rother councillor from 2007 until 2015 has died. Mrs Winterborn was first elected on May 3, 2007, and served on Rother District Council until May, 2015, when she stood down from the council. Leader of Rother District Council Carl Maynard said: “We are very sad to hear of the death of former councillor Frances Winterborn and our thoughts are with her family at this time. “Her sense of humour was legendary and she was very popular with her colleagues, regardless of party politics. During her two terms, Liberal Democrat Mrs Winterborn served on the licensing and general purposes committee, overview and scrutiny committees, seafront strategy working group and the member development task group. She was vice-chairman of the resources overview and scrutiny committee from 2012 to 2014. At the end of her time as mayor she was praised for her charm and commitment to the community. During the first six months, she threw herself into fundraising for her chosen charity, Bexhill Caring Community, staging a highly-successful variety concert. But ill-health marred the second half of her year of office. If you would like to pay tribute to Mrs Winterborn you can email laura.cooke@jpress.co.uk, call 01424 856783 or comment below.